Don't be so hard on yourself, you are now in a different climate and will have to learn some things anew. I am in a very different climate than you so I don't know how much specific help I can offer so I'll just throw out a few thoughts. I always protect recently re-potted trees from freezing. 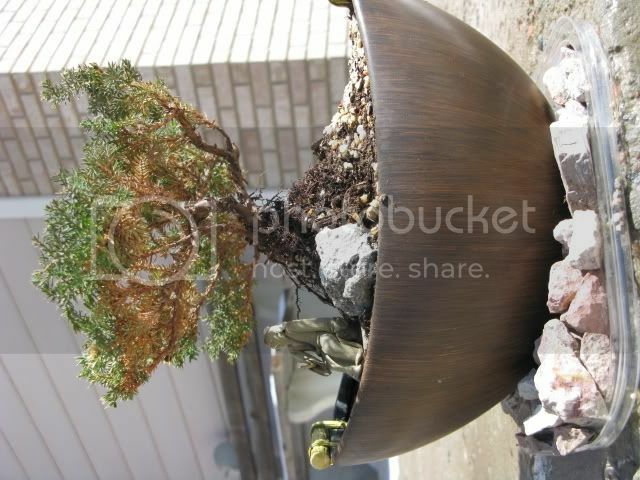 Your tree is potted rather high in the pot thus exposing a lot of the root system to extreme temperature swings. You're right of course that Junipers belong outside but can you try to find a more sheltered location for it for now, perhaps a porch or breezeway. I might also consider applying some temporary top dressing to protect the exposed roots, something like long fibered sphagnum moss. Sorry I can't offer any magic bullet to save your tree, does anyone else have any suggestions? alisios this is much closer to you than me. Was your tree always planted that high in the dirt? What were the roots like beneath that? When did you re-soil it? Cut any roots? That pot looks like it can hold a lot of moisture in the bottom - does it? I don't have any magic bullet either - have you done the scratch test to see if there is any green underneath? okay....ive been keeping it in the porch area by the front door....i just repotted it BECAUSE when the soil froze and froze again, the original ceramic pot broke........so i said heck*, lets get a new pot and see if new soil will jive this turkey......i have rocks in the bottom of the pot so hopefully it drains well.....it hasnt always been potted that high up out the dirt......i was going for that cool arty japanese look yeah... ! anyways....ive been keeping it the garage at night so its not so harsh as far as the temperature..........ummmmm didnt cut any of the roots... um theres no moss in this region really....................not humid, moist enough in the air.....if you see the grass in the background of my pics, not even that survives! I'll pinch off the dead branches to keep tabs on the situations....good idea? welllllllllllllllllllll, ill layer more dirt over the roots........and are you sayin i should let the dirt dry out some? 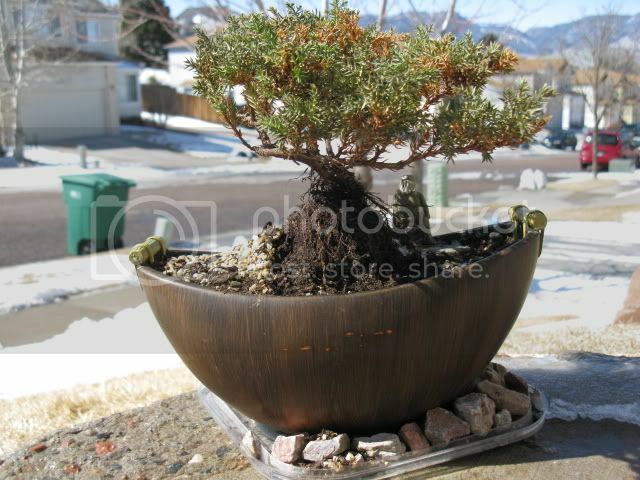 Can Any Plant be Used for Bonsai? 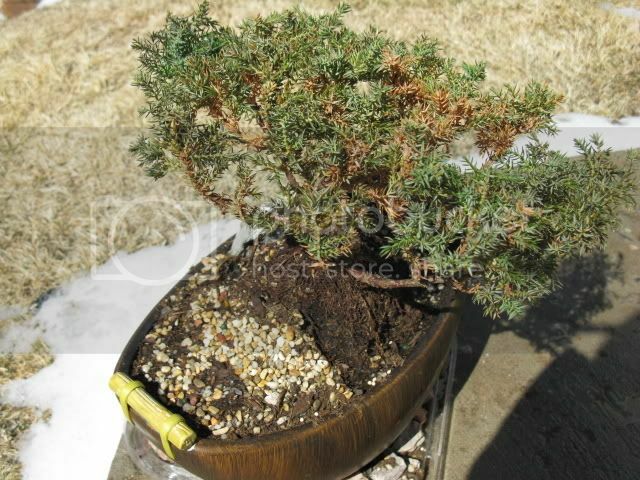 Advice on this bonsai plant? I'm still not sure what it is!